From bankers and laborers to teachers and doctors, Ms Greenburg says there is ‘not just one type of person who joins the Rockabilly community’. 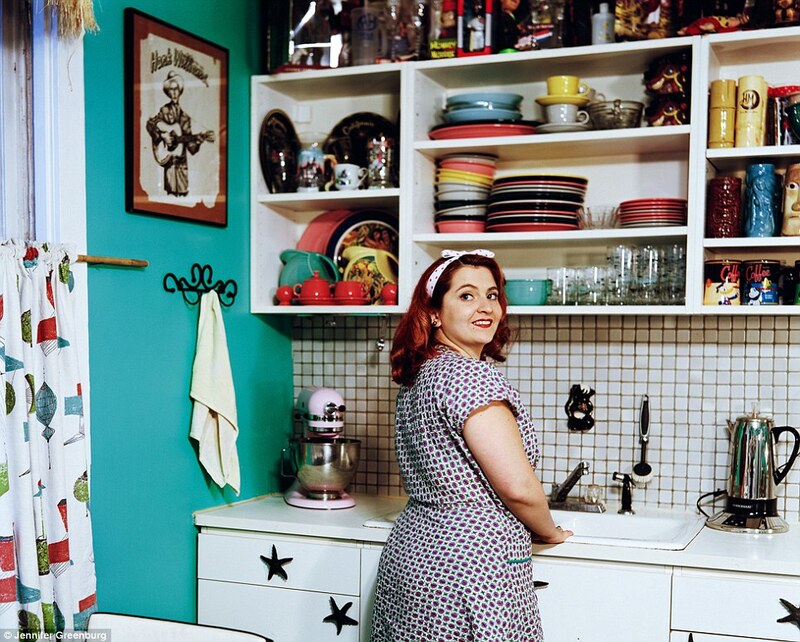 It is this affinity for quality that Ms Greenburg believes the Rockabilly community, which spans across pockets of people in almost every city, is most attracted to: the ‘joyous’ design and ‘beautiful’ functionality of furniture, clothing and ephemera of the Fifties. 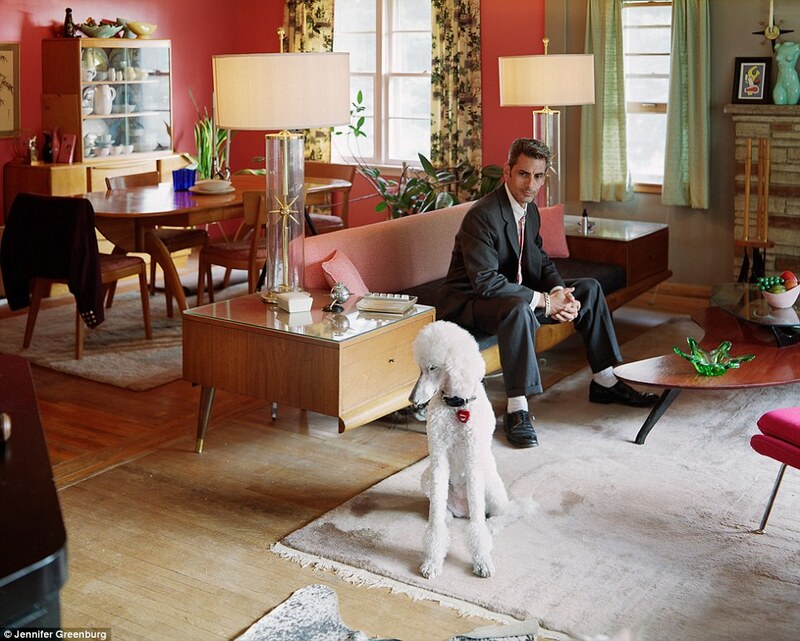 ‘The middle of the 20th Century in the United States was a time when design was in its heyday,’ she said. ‘Everything American’s owned at that time was designed, and made by, an industrial designer who labored over not only how things should function, but also, over how things should look. 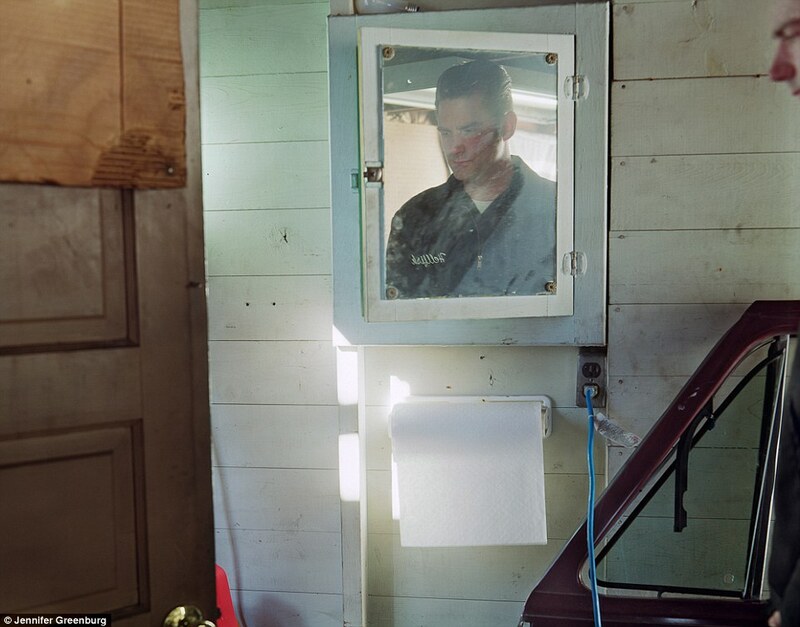 The community of people Ms Greenburg has documented, she believes, usually have a desire for this kind of joyousness that was lost in the 21st Century. ‘Happiness, I believe, is everyone’s primary full-time job. 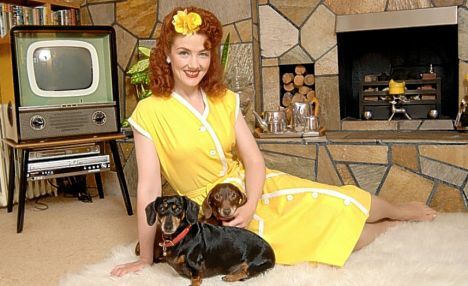 And living a life that resembles, visually, the 1950’s helps make that just a little easier,’ she said. 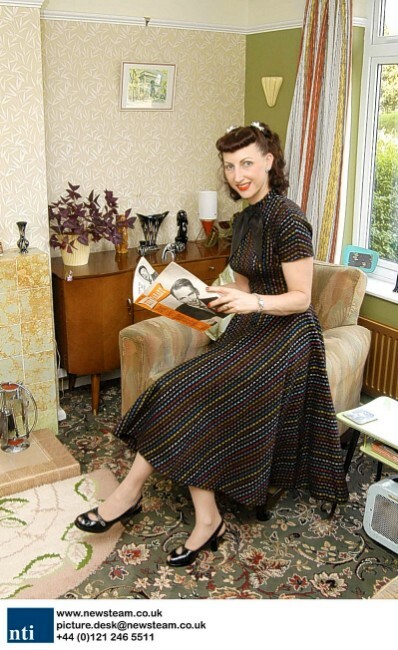 From re-wiring a lamp, to re-sewing the seams of a Fifties cocktail dress, Ms Greenburg added that most true participants of the culture are skilled at repairing and restoring most of their possessions. Ms Greenburg, who has collected vintage clothing and jewelry since she was a child, said she started the project because she is ‘as much of a participant in this culture as in any culture’. 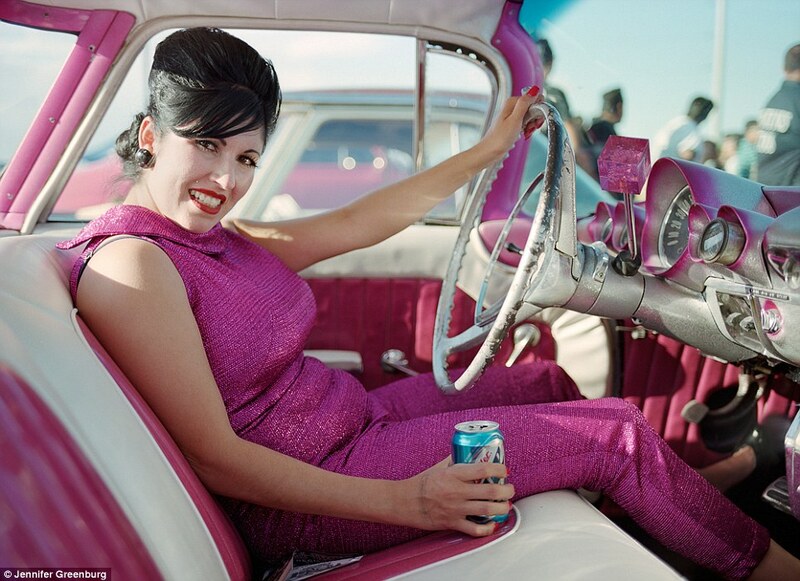 She added that she took the time to get to really know the people in the Rockabilly community before she began photographing them. 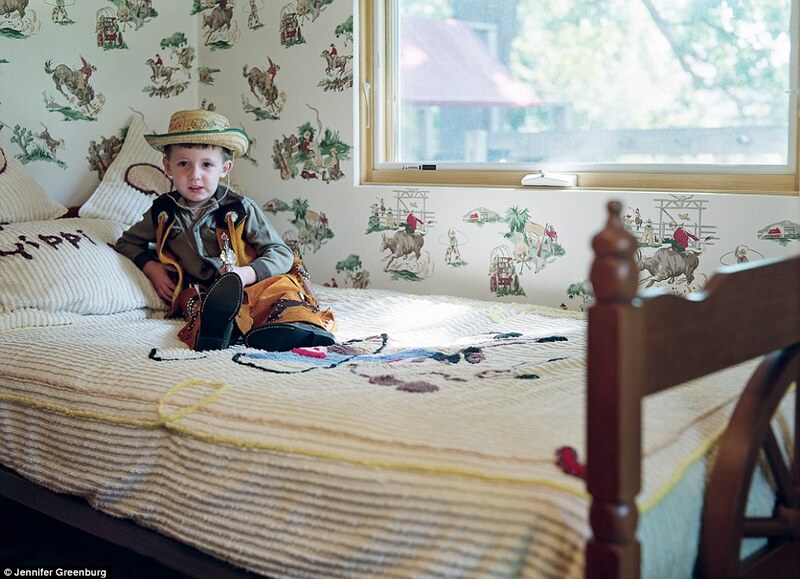 The children growing up inside of the Rockabilly culture, including the boy in the cowboy getup, seem to love their eccentric lifestyle. ‘They don’t usually like Justin Beiber, which actually, gives them a lot of cache among their peers,’ said Ms Greenburg, who still keeps in touch with many of her subjects, even spending New Year’s with the family she photographed sitting in the front of the television. Joanne Massey: ‘Living like this makes me happier’We’ve been married for 13 years and we’re extremely happy because we both know our roles. There is none of the battling for equality that I see in so many marriages today.What’s wrong with wanting to be adored and spoiled? If I see a hat I like, I say ‘Oh, we can’t afford that’ and Kevin says: ‘You have it, I’ll treat you.’I don’t even put petrol in our Ford Anglia car, which is 43 years old, because I think that is so unladylike. I ask Kevin to do it. I make sure our home is immaculate, there is dinner on the table, and I look pretty to welcome my husband home. 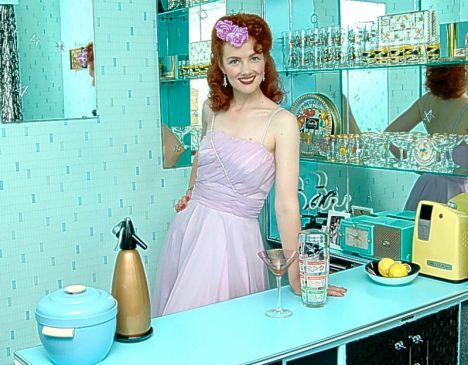 My kitchen is an original ‘English Rose’ design, with units made from metal, which was very much the ‘in thing’ then. We bought it from a family in Scotland who saw our advert in an antiques magazine. They had it in their garage to keep tools in, so it needed renovation. 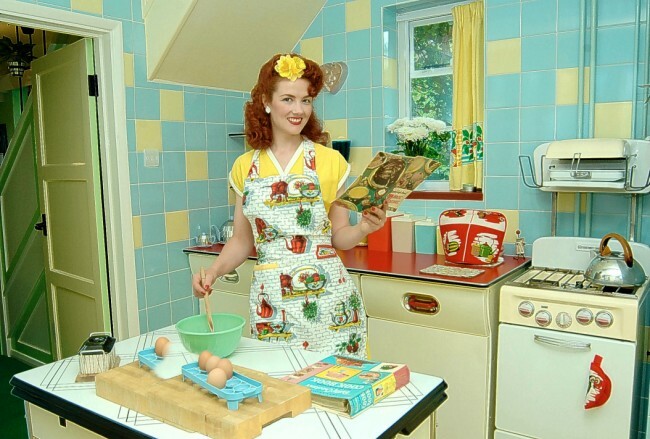 I have an original Kenwood Mixer, the phone is bright pink Bakelite, and even my crockery is original 1950s. We had the hall carpet made for us with an authentic swirling geometric pattern. I like to close the front door, pull off my gloves and know that I am in my own world. I only ever wear 1950s clothing, such as tight pencil skirts, a white blouse and a wide belt. Kevin wears ‘modern’ clothes for work, but at weekends he wears a smart suit and a trilby. I admit I am in retreat from the 21st century. When I look at the reality of the world today, with all the violence, greed and materialism, I shudder. I don’t want to live in that world. I went to a grammar school and could have gone to university, but chose to work in a bank. I was marking time until I met the right man. 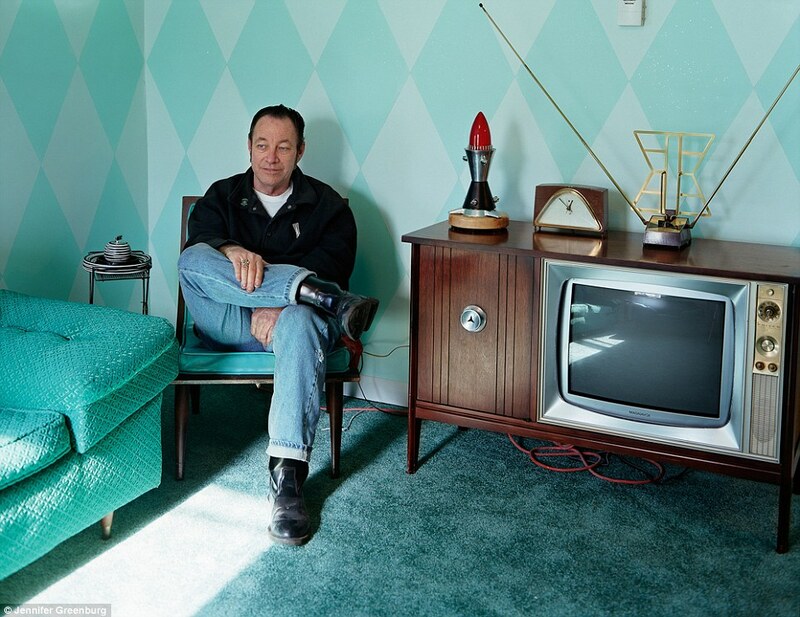 Kevin and I met in 1993 at a Fifties Convention, and we had an old-fashioned courtship before he proposed. I was ecstatic, because I had found someone with the same passion for the period. Today’s society is all rush, rush, rush, whereas I like to take my time. 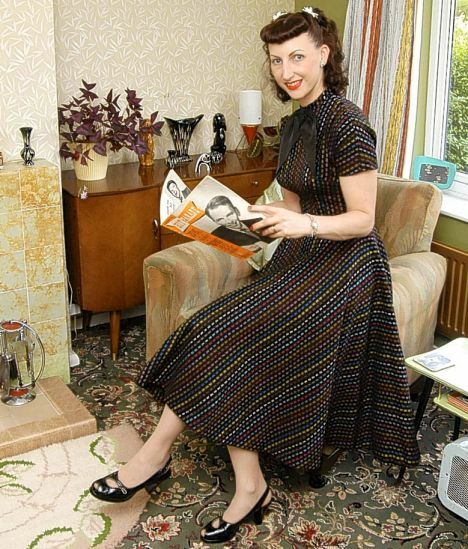 I never leave the house without lipstick on, and I also like to help neighbours – collecting their pensions and doing shopping for them, just as women in the 1950s would do. It may sound silly, but living like this really does make me happier – as though I’m existing in one of those old-fashioned TV shows where everything is always wonderful. My despair at the modern world is one of the reasons why we haven’t had children. I would be terrified they would be offered drugs, or become the victims of violence. Some women I meet ask me if I feel patronised by being a housewife and spending my time caring for Kevin, but I never would. At work, he gets teased because he’s the only one with home-made cakes and even home-made jam in his sandwiches. But I often wonder if his colleagues aren’t slightly jealous that he has a wife who devotes herself to his happiness. How many men these days can really say that? Other women may laugh at my determination to make my home perfect for my husband, Martin, but I enjoy spending my leisure time baking cakes and sewing. I really believe that women today have lost their way, with bingedrinking ladettes and children as young as 11 going out in tiny tops. The age of innocence has been lost and it is such a shame. My idol is Ava Gardner and when I watch her films – as I do all the time – I think that so much has been lost from today’s society. 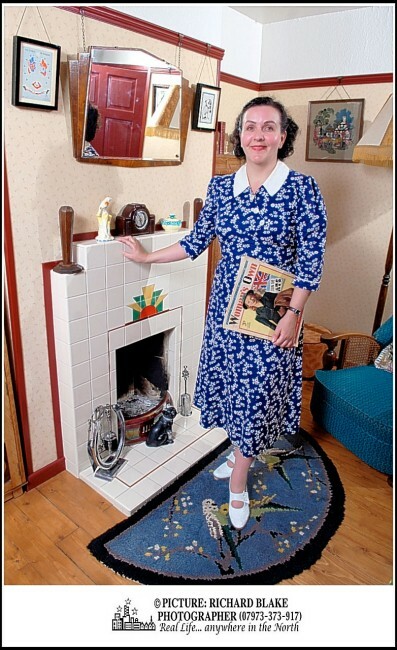 I’ve made my home a shrine to the Forties, and I only ever wear clothes from that decade. Other people may laugh at me, but I really don’t care. I think I have a far happier marriage than many other people I meet, because we have strict demarcations in our roles. I do all the cleaning, ironing, washing and cooking, and Martin puts up shelves and looks after the car. He’s the breadwinner and I create a lovely – and loving – environment for him. I met Martin when I was 17 – we lived in the same village – and he has been my only serious boyfriend. It’s so much more romantic only ever to have been in love with one man. My obsession with the 1940s really began through Martin, as he was already going to Forties events when we met. 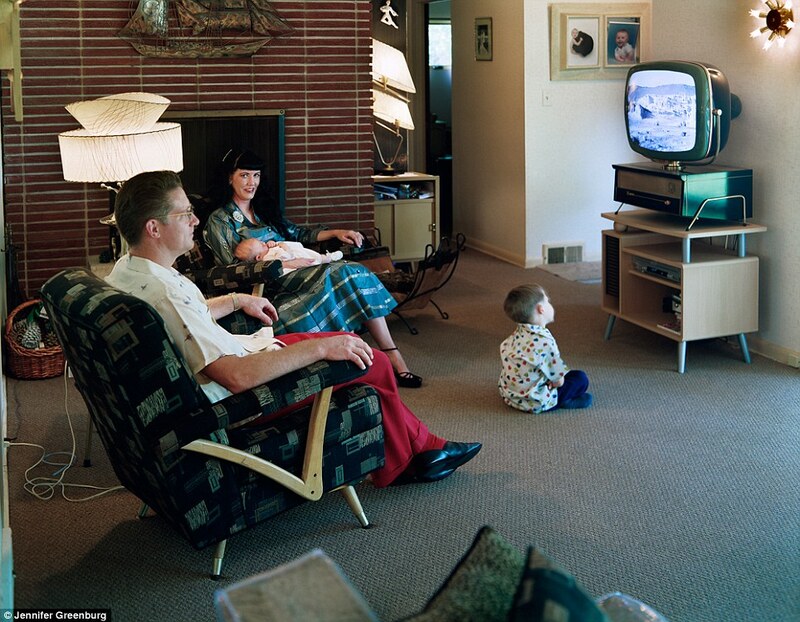 I have spent so many happy hours sourcing retro furniture and kitchen gadgets for our home, and gradually we are eradicating every trace of the modern age. 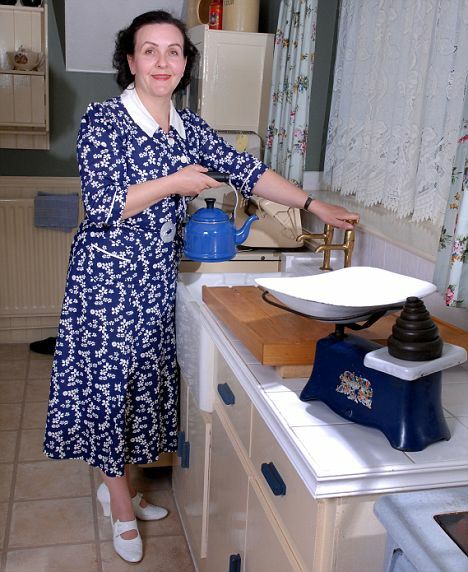 We have an old black Bakelite phone, I use a retro Swan kettle and a full 1940s dinner service which my parents bought for us from an antiques centre. I inherited our oak bedroom suite from my grandparents. It’s stamped with the ‘CC41’ utility mark, which shows it complies with the rationing of the time. Likewise, some of my clothes are stamped with the same mark. 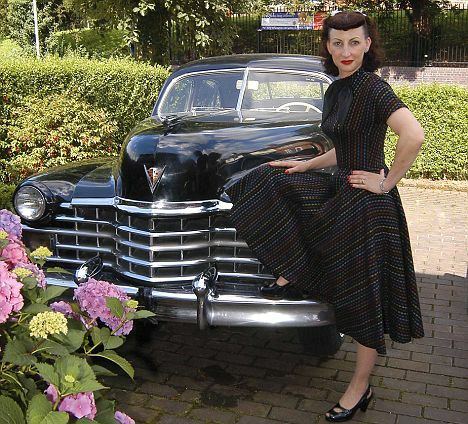 I wear vintage dresses during the day, and for evenings and weekends I will dress up in the full glamour of satin evening dresses with high heels. I wouldn’t dream of leaving the house without gloves and a hat. When we go out, we do attract a lot of attention and some people laugh, but I think that is their problem. We aren’t friendly with anyone who doesn’t share our love of the Forties. Some people might think I am hiding my head in the sand, harking back to an age that is long gone. But to me, the 1940s was a time when people were much more friendly to each other – they really cared about their neighbours. As it is, I hardly know the people who live next to us. Of course, I’m not such a Luddite that I don’t use modern medicines and other comforts of modern life when I need to, but I find a genuine happiness in living in a time when life was simpler. My job is to devote myself to Martin. He has a physical, stressful job and he loves coming home to a wife who looks pretty, has his meal ready in an immaculate house and has all the time in the world for him. My love for the Thirties started with the music. As a teenager, I loved to listen to the big band sound and I would sit entranced for hours watching films starring Fred Astaire and Ginger Rogers. They were so glamorous. Back then, the world just seemed a sunnier place, even though it was an austere time between the wars. Women were these amazingly glamorous creatures, with their perfect hair and immaculate makeup, and they were treated with such respect by men. Men and women knew their roles in society and there wasn’t all this pressure on women to have to go out to work and try to be equal to men. I do work part-time, but only because we need the money. However, we still have clearly defined roles in the home and I am the one who does most of the cooking and cleaning. 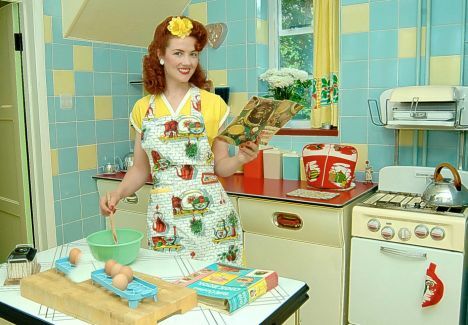 I adore baking cakes and if I had my way I would spend all of my days in my pinny, making my house look immaculate. 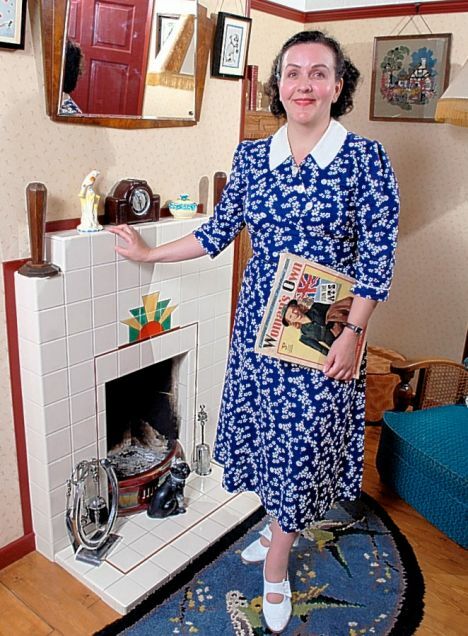 Martin and I spend hours sourcing clothes from the 1930s and I am always dressed in period costume. I usually spend around £50 to £150 per item. I buy them from the internet and vintage clothing specialists, and I have wardrobes full of wonderful old clothes and items such as cloche hats and Mary-Jane shoes with T-bar straps. Comments from strangers can be pretty bitchy, though, because people just don’t like anything that’s out of the ordinary. The Thirties was a much more moral time and there was a real camaraderie between people. I try to escape from where we are now and rarely read newspapers because I find today’s world so depressing. The pace of life today is so hectic and I think there is so much pressure on women to be like men. It is all wrong. I love to wear dresses and skirts, look immaculate and be treated like a lady. 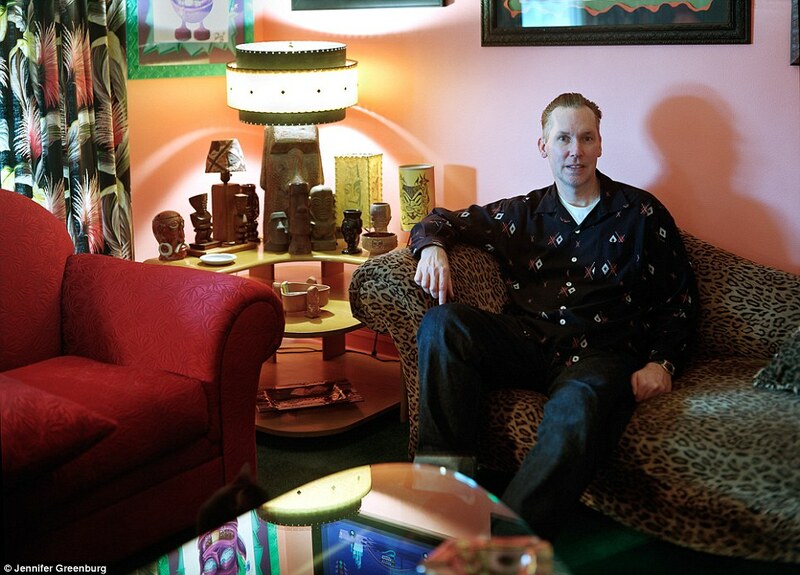 My home is entirely decorated with 1930s furniture, wallpaper, carpets and ornaments. Retreating to this world is our sanctuary. 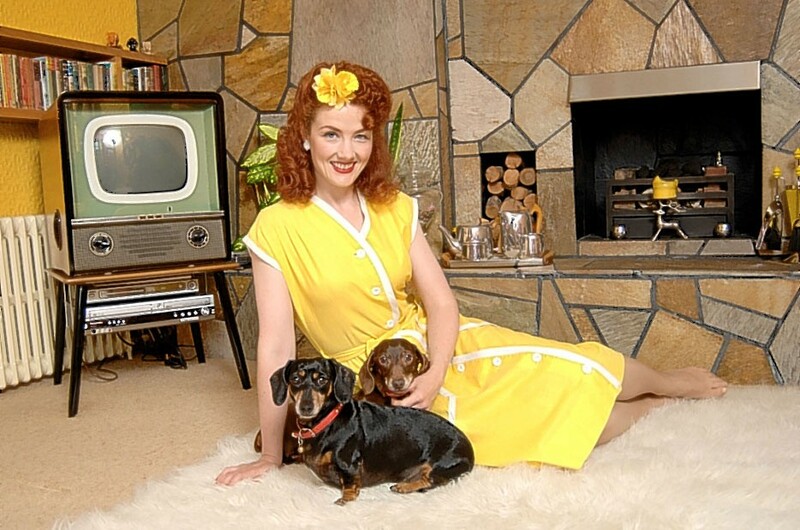 This entry was posted in Blog and tagged 1950's.1940's, kitsch, rock n roll, rockabilly, vintage lifestyle.